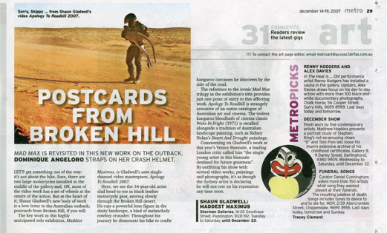 Shaun visited in January 2011 to extend an ongoing series of work engaging the environment of Broken Hill and Silverton. Other artists involved in the project and residency included Josh Raymond and Gotaro Uematsu. During Shaun's last visit he produced the MADDESTMAXIMVS: Planet & Stars Sequence, 2009 Australian Pavilion, Giardini 53rd International Art Exhibition - La Biennale di Venezia. Shaun is the patron for the Broken Hill Art Exchange Inc. and been artist in residence on several occasions. He first visited to make his work Apology to Road Kill (2007), presented at the Sydney Biennale (2008) and Venice Biennale (2007). Shaun was artist in residence during the making of MADDESTMAXIMVS: Planet & Stars Sequence (2009) produced the 53rd International Art Exhibition, 2009 Venice Biennale. At the Biennale Shaun presented his work, MADDESTMAXIMVS: Planet & Stars Sequence (2009) in the Australian Pavilion in the Giardini. In October 2009 Shaun was selected as the Official war artist in Afghanistan. He travelled through Afghanistan and several bases in the Middle East and he is the first war artist to use video media. Much of Gladwell’s work is influenced by his experiences in Australia’s landscape of the outback. His work critically engages personal history, memory and contemporary cultural phenomena through performance, video, painting and sculpture. Shaun Gladwell has exhibited in major national and International exhibitions; including The Mind is a Horse, Bloomberg Space, London (2001) and the Yokohama 2005 Triennale of Contemporary Art, Japan. Gladwell’s work was also represented in the 2006 Biennale in Busan (South Korea) and Sao Paulo (Brazil). In 2008 he exhibited in Sydney and Taipei Biennales. Gladwell’s Storm Sequence generated positive reviews from a range of international newspapers and journals including Art in America and Frieze magazine. Shaun Gladwell is represented by Anna Schwartz Gallery, Sydney, Melbourne, Australia.